The Crystal Clover (フォー・リーフ?, lit. : "Four Leaf") is a treasure found in the game Pikmin 2. 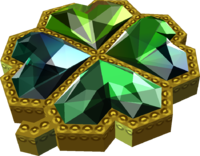 It is a golden brooch embedded with pieces of emeralds into a shape that resembles a four-leaf clover. The item is found on the first sublevel of the Bulblax Kingdom and is held by an Orange Bulborb. The Crystal Clover being analyzed. An emerald from the real world. This page was last edited on December 12, 2018, at 11:03.